Home » All steel katar, Bundi style? All steel katar, Bundi style? A nice all-steel north Indian katar with a strong, ridged blade with swollen reinforced tip. 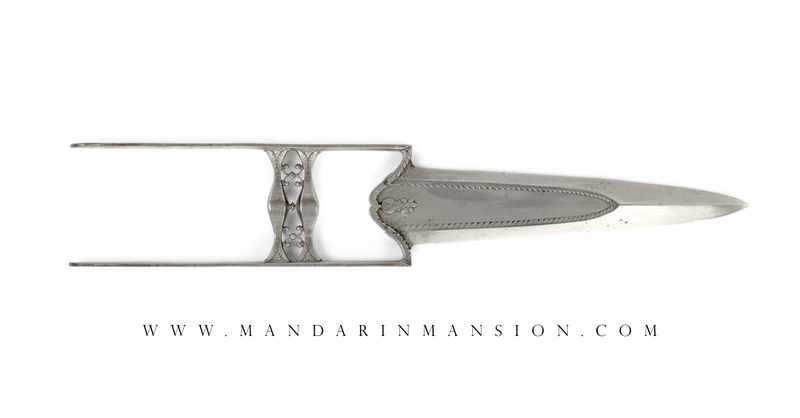 The blade features a sunken panel with very finely chiseled "tree of life" motiff of small leaves. It's hard to see in its current state, but in just the right light you can make out that the panel -and quite possibly the whole katar- is of a fine grained Indian wootz. 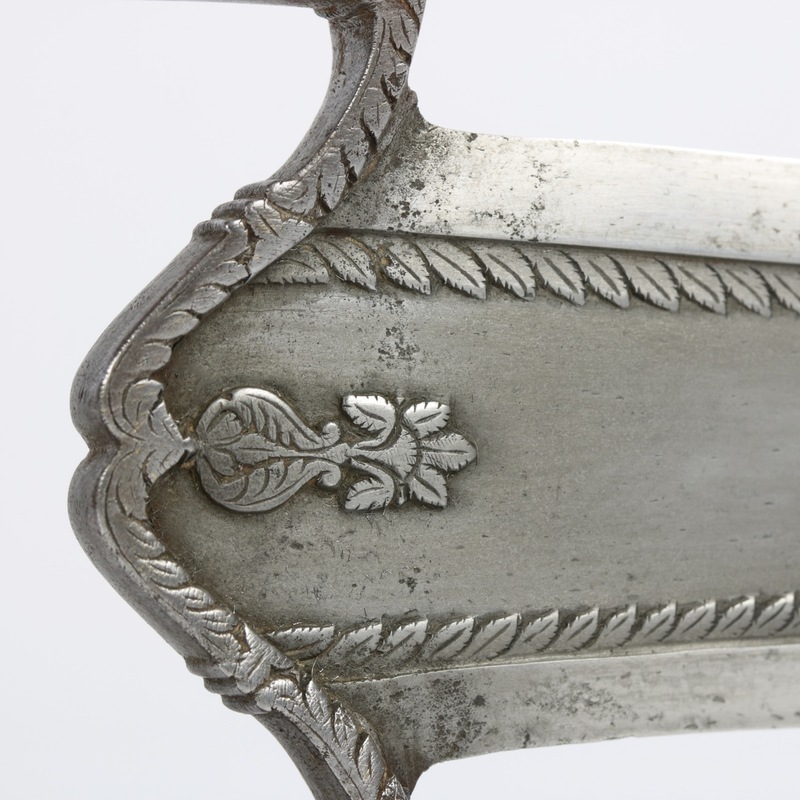 The panel is further decorated with a floral motif at the base of the blade. It sits atop a W-shaped base, again decorated with leaves in fine chiseling. The two handle bars are of typical form, with triangular bases on each side and a swelling in the middle. Both pyramidal bases are chiseled with leaves, and in the middle they connect my means of a small disc. In the spaces in-between the handle bars are two floral ornaments. It comes with its original, velvet covered scabbard.
" Plate XL - Five daggers. Katar> . (1) Blade with three ribs; sheath, wood covered with leather and velvet. Made at Delhi, 1805. (2) Blade with a central and side ribs. Black embossed leather sheath. Made at Burhanpur in 1853. (3) Blade, steel with three ridges, of which the centre is like a cypress tree. Sheath, wood covered with scarlet velvet and a gold band. Made at Boondi in 1803 by Thakursidas, an Ulwar servant. (4) Blade, steel with central ridge, at the top of which is a gilded ornament. 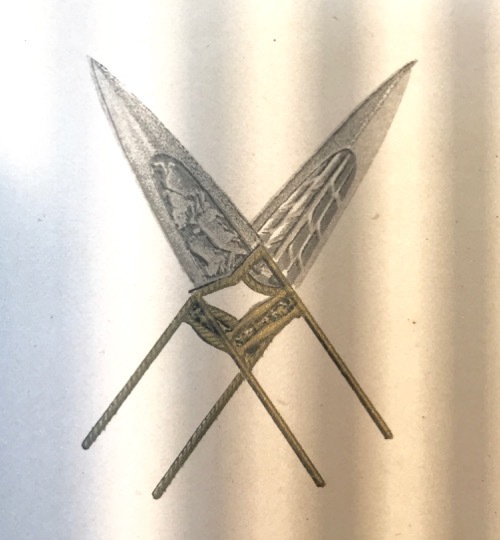 The bars and side guards of this, as well as the other daggers, are damascened in gold. sheath, wood covered with scarlet velvet and gold lace. Made at Boondi in 1807. 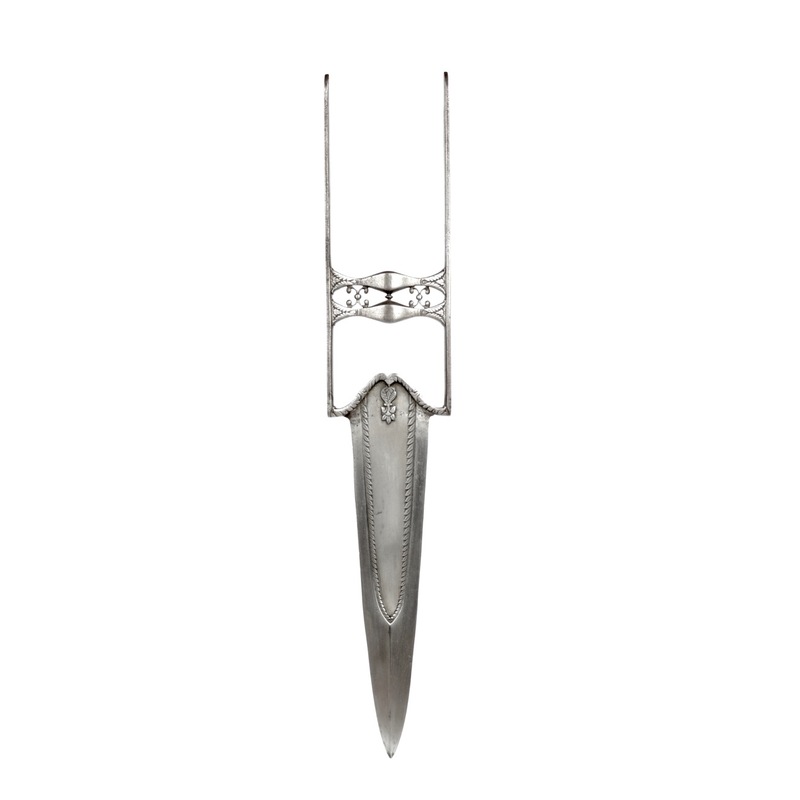 (5) Blade Ispahan steel with one central rib and serrated edges. 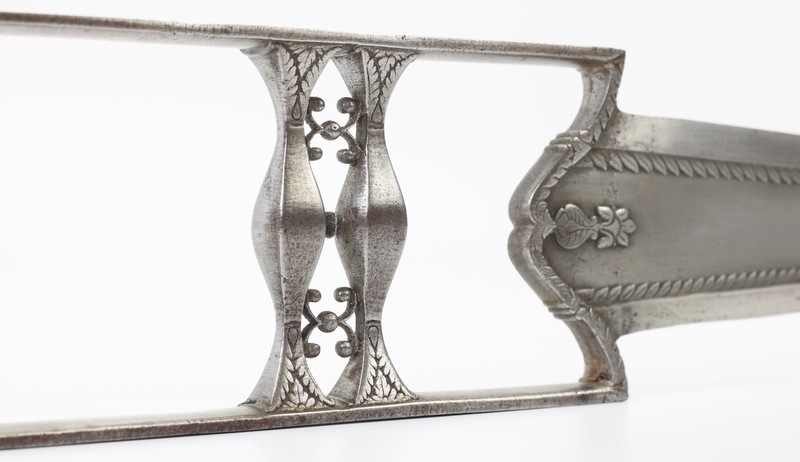 Bars and side guards damascened with a bold floral pattern. Sheath, wood covered with scarlet velvet, with a purple piece at the top. Made at Delhi in 1807. Close-up of the "Boondi katar". Notice how katar 1, 3 and 4 bear quite some resemblance to our katar. Number 1 is made in Delhi, 3 and 4 are made in Bundi. 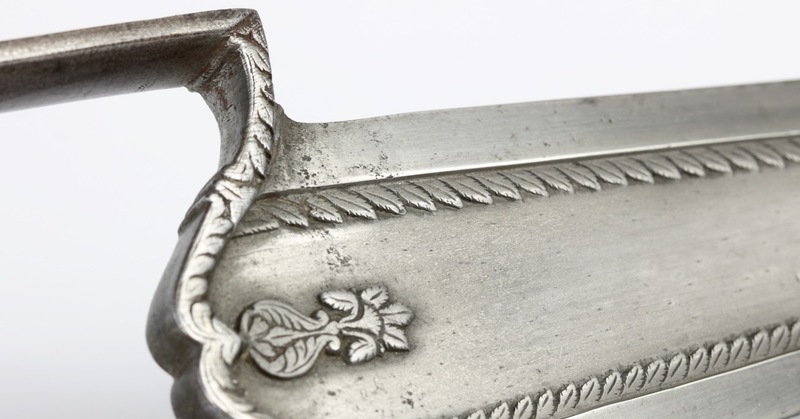 From this it seems that the characteristic ornaments between the handle bars are not necessarily a hallmark of Bundi because the Delhi katar also has it. What the two Bundi katar have in common is that the two handle bars are subtly connected in the middle, not by proximity but by means of a separate element positioned in-between them. On ours, it's a little disc. 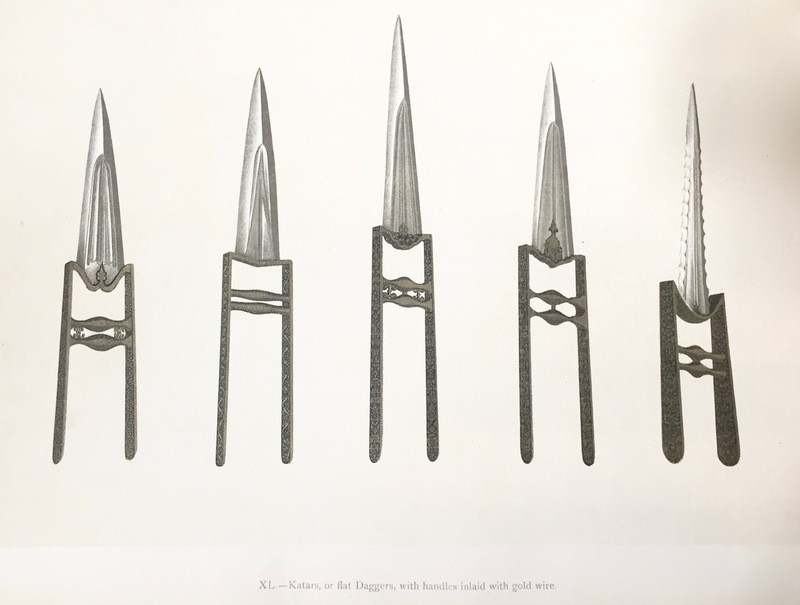 Also note how the Bundi katar that is most like ours is very expensive compared to the others, costing four times as much as the somewhat similar one made in Delhi. 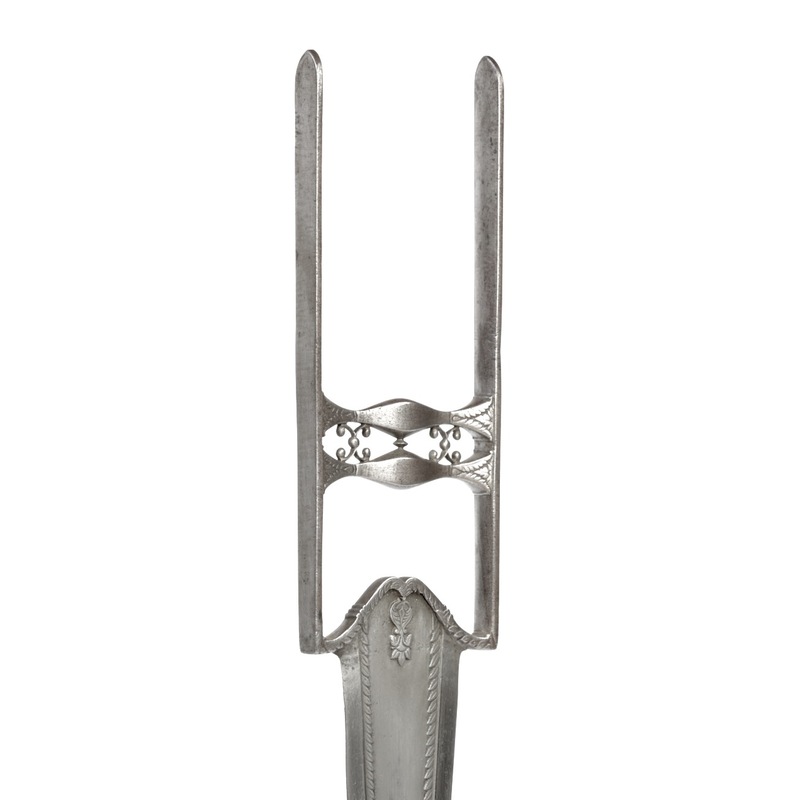 The example that resembles our katar most is supposedly made by Thakursidas, an Ulwar servant. One can't help but wonder whether he was producing an Ulwar style, or was producing in a style typical for Bundi. The Bundi attribution of all katar of this shape is thus far from solid. We can only conclude that a piece much like it was produced in Bundi, albeit by an Ulwar servant, in the beginning of the 19th century. Geographically, Ulwar (today Alwar) lies in-between Bundi and Delhi. Delhi is some 150 km to its northeast, and Bundi lies about 300 km to its southwest. So even though the Bundi attribution is not solid, it is safe to say that this style probably originated in the Delhi / eastern Rajasthan region. There is a display of arms in the Royal Albert Hall museum in Jaipur called "Tiger knives" that lists a katar just like it as being from Bundi. The display can be seen on this travel blog. 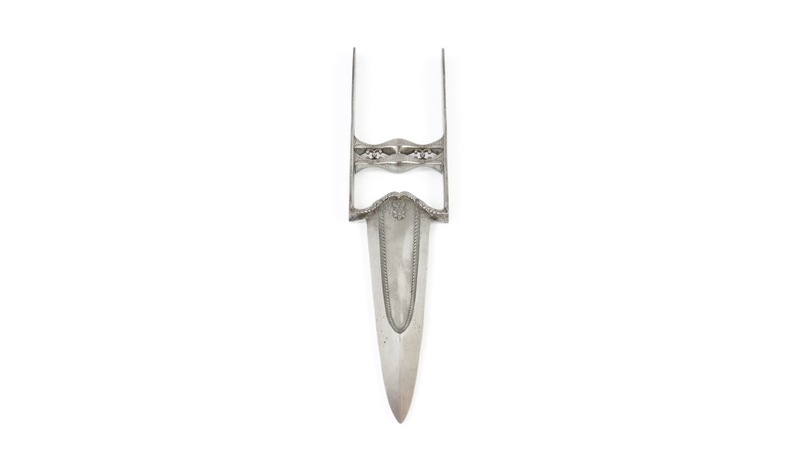 There are a few katar daggers that are definitely made in Bundi. One of them is in the Metropolitan Museum, accession number 36.25.912. It has an inscription saying: "Bundijaram, Lord of Bundi, will protect with this dagger, [for], when it pierces, is like the tongue of death." The other side bears a date corresponding to 1852. 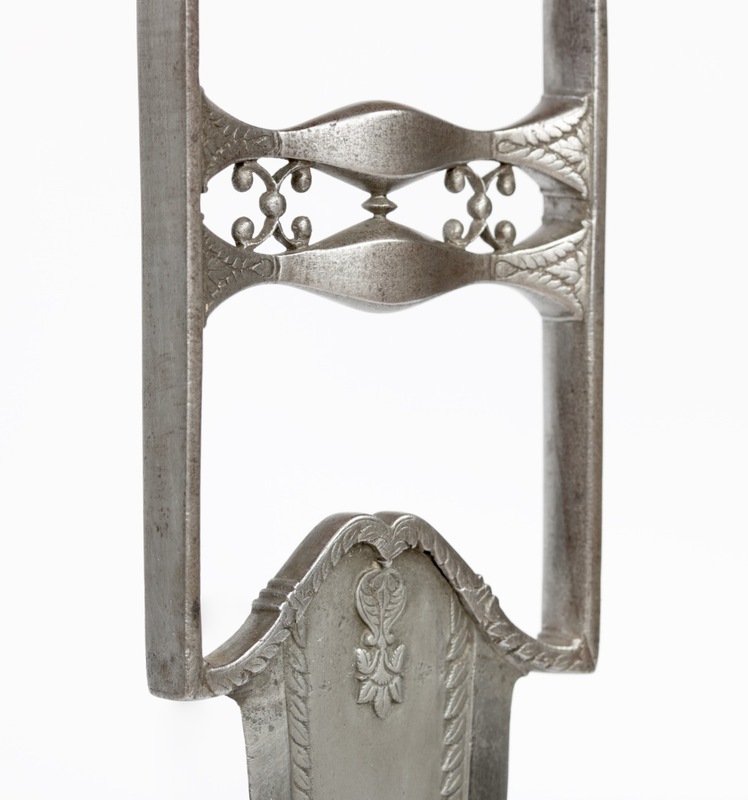 What this piece has in common with those from Bundi described by Hendley, made about half a century earlier, is that the handle bars connect in the middle by means of a separate element. (In our case a little disc) Otherwise it is quite a different style. The Metropolitan Museum Bundi katar, accession number 36.25.912. "8.) Dagger. Katár. the double cross-bars and side guards are inlaid with gold in a bold pattern. There are figures of animals raised from the surface of the centre of the blade. The sheath is of leather, with a steel damascened tip mount. On both sides there is engraved a verse in Persian. Length 14 1/2 inches. Made at Burhanpur, Central Provinces. Damascener, Sheikh Rahim-ullah, of Ulwar. Date about 1846. 9.) Dagger. Katár. The double cross-bars and side-guards are enriched with well raised arabesque patterns in gold. There are three ribs on the blade united by cross-ribs. Sheath of embossed leather. Length, 18 inches. Made in Sirohi of Ispahan steel. Bought in 1836. 1. The Metropolitan Museum's royal Bundi katar is originally from Sirohi, possibly further embellished at Bundi. 2. It is originally a Bundi style that was also produced in Sirohi. 3. The style was produced in a fairly large area including Bundi and Sirohi, and not peculiar to either city. 97. (Case E) Much likeness to Metropolitan Museum 36.25.912, presented by the Maharaja of Bundi. 124. (Case F) Similar in shape. Presented by H.H. the Maharaja of Bhurtpore. 159. (Case G) Identical in shape. No attribution. 165. (Case H) Identical in shape. No attribution. 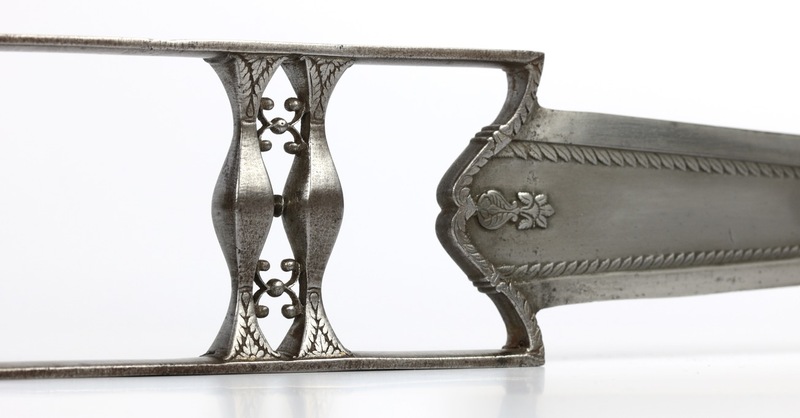 A north Indian steel katar of pleasant geometry and with very detailed chiseled decorative motifs. It is of a style that is often identified as being of a type coming from Bundi, an attribution that is not yet entirely solid yet does seem to hold some merit. At the very least we can say that it is of a style that was definitely produced in Bundi, but was perhaps not peculiar only to that city. 1. Thomas Holbein Hendley; Ulwar and its art treasures , London: W. Griggs, 1888. 2. C Purdon Clarke; Arms and armour at Sandringham: the Indian collection presented by the princes, chiefs and nobles of India to His Majesty King Edward VII when Prince of Wales, on the occasion of his visit to India in 1875-1876 , W Griggs & Sons, London, 1910. And Indian Art in Marlborough House: A Catalogue of the Collection of Indian Arms and Objects of Art Presented by the Nobles of India. W Griggs & Sons, London, 1910. 3. Thomas Holbein Hendley; Ulwar and its art treasures , London: W. Griggs, 1888.